Whether you’re head chef, sous-chef, or even commis in your home kitchen, there’s one thing you’re sure to need in your arsenal, and that’s a good set of knives. With more of us making a return to preparing food from scratch, whether it’s because we enjoy the ritual, we want to hone our skills, or for health reasons, good-quality kitchen knives are just as important as a set of decent non-stick saucepans, and you can discover the elite here in this list of the best saucepan sets. To the first-time buyer, it can sometimes feel like you need a Cordon Bleu certification to make an informed choice. Luckily, our buying guide to the best knife sets is here to cut out some of the guesswork. A good kitchen knife set is a heavy investment, but one that’s completely worthwhile for any enthusiastic home cook. A paring knife or vegetable knife for trimming, seeding, and other delicate jobs; an all-purpose chef’s knife for preparing meat and tougher veg; and a long bread knife for cutting loaves without crushing them are the very basics, and are included in each of the sets featured in our list. They’ll cover a good deal of the prep work between them, but keen chefs will no doubt be enthused by the extras in these sets, too: blunt-ended Santoku knives for slicing and dicing, perfect for making ultra-versatile soffrito; fine-edged carving knives for serving up a seamless Sunday roast; and boning knives for the amateur butcher. When it comes to materials, both stainless steel and Damascus steel are incredibly durable and easy to keep clean, making them perfect for heavy use in the kitchen- make sure they're accompanied by an equally durable chopping board! The distinctive mottled finish of Damascus steel is a result of its carbon steel core being surrounded with tough layers of stainless steel, resulting in a super hard, super sharp blade, giving it the slight edge (if you’ll pardon the pun). Finally, consider the handle, whether it will be long enough for a good range of movement but short enough to control, and more importantly, comfortable enough to use every day. This compact knife carousel puts the tool you need at the forefront without taking up worktop space. Its selection of six knives will be comprehensive enough for most home cooks, and their sharp blades can handle a wide range of tasks easily while keeping their edge. The integrated tool rest keeps in-use blades from making contact with the worktop, and the weighted handles feel secure for nervous choppers. If you are looking to invest in a good quality kitchen knife set from a trusted brand and you don't want to overthink it, the Joseph Joseph Elevate Knives Carousel an ideal choice. This sleek offering from the Robert Welch Signature range is the best investment knife set on our list. As well as a 25-year guarantee, the set comes with an integrated ceramic wheel sharpener to keep your blades in good nick use after use. 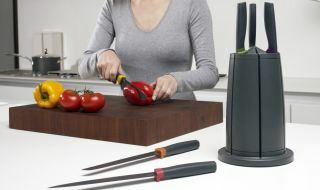 The six ultra-useful included blades will also cover most cooking tasks between them, and the elegant handles are smooth and comfortable to use. If you have been persevering with an ageing beginners knife block and have since upped your chef game, this is the perfect 'first proper knife set' option. This tempered glass set not only looks fantastic (the clear construction offers a decent excuse to admire your purchase every time you pass) but gives the illusion of taking up less space on the worktop than some bulkier-looking opaque models. The sharp blades are ultra-precise, especially for this price range, and the ergonomic Santoprene handles are non-slip for safe and easy slicing. If the Robert Welch Signature Knife Block Set in this list took your fancy for its quality and performance but you want a more wallet-friendly option, these are professional level knives with an intermediate level price tag. Originally used to make knives in the Near East, Damascus steel has certainly stood the test of time, and no wonder. It’s very, very sharp, and phenomenally tough thanks to a super hard central core — hence the hefty price tag. This is truly a set to last you throughout your culinary career, and even the stand, beautifully constructed from tempered glass and acacia for visibility and safety, is sure to remain timeless. This knife set is not for beginners, these knives are the best pro choice for a pro cook. The most inexpensive knife set on our list, this Jamie Oliver offering is the best budget buy but can still walk the walk when it comes to everyday prep. The full-tang Japanese stainless steel blades on these knives retain their edge incredibly well, so they can be used time after time, and the end of each knife is embossed with its name, a nice touch which makes mid-cooking selection from the attractive wooden block quick and easy. If you are looking for a good quality knife block for a housewarming or wedding gift where you are unsure of the recipients cooking credentials, look no further. Six or seven knives seems to be the sweet spot for maximum kitchen utility without blowing out your budget, and this seven-piece set from Global packs enough paring power to see you through a multitude of kitchen tasks. Incredibly sharp, high-quality blades — following the strong samurai tradition in which they were first made — make light work of meat and veg, and the smooth rounded handles, with their distinctive design, are comfortable to work with.